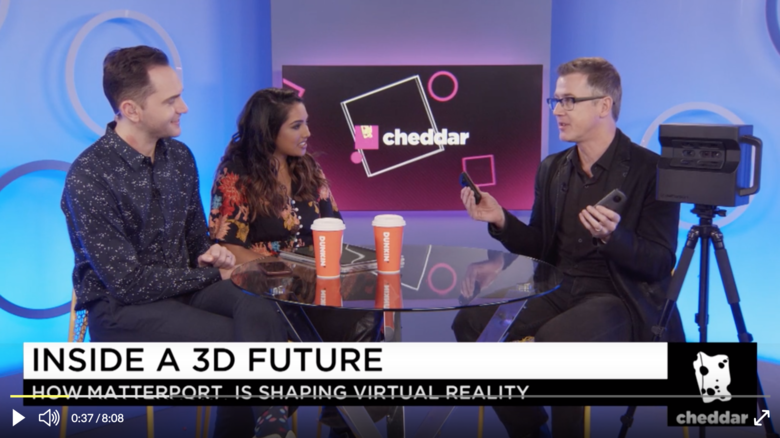 Check out this 8-minute Cheddar video interview with Matterport CEO RJ Pittman on Tuesday (29 January 2019) on the opening of the Matterport platform to include under $500 360º cameras, Insta360 One X and Ricoh Theta V.
I'm interested to see if MP will adapt other 360 cameras especially the 4K and up cameras that use a sensor behind each lens as this will be a game changer for the capture market. I'm also interested in Google's take on this, will they accept MP 360 captures into their Street View program. Dan, did you have any insight into this? Yes, I'm aware of that. I'm talking about the new MP 360 tours, how will MP handle these as well as Google. Will they treat the MP 360 VT just like a normal VT's and MP will charge you $14.99 or want ever they charge to convert them. that was my question. Great question. I will circle-back to the Matterport exhibit at ICNY19 tomorrow, Friday (1 February 2019) with this and other questions from the WGAN Forum Community. Plans for supporting other cameras exist and will be revealed as progress is made. The main thing is whether they are OSC and have an SDK for incorporating into remote capture. The Theta V and instaONE X are excellent choices as they are the most accessible, recognizable devices. I would imagine that the next devices would include the insta360 Pros seeing as there is an existing partnership. I would also imagine that Ricoh must be working on a higher end solution as the V came out quite a while ago and insta is their main competitor. I don't know anything, but it just makes sense.